The Place Located at Hong Kong Street, there have been some changes at Bacchanalia the last one year and it is good that the concept has finally firmed up with its recent reopening. Spotting a new sleek and contemporary look, the 24-seater is now branded as Bacchanalia by Vianney Massot. Chef Vianney Massot was previously the Executive Chef of the now-defunct two Michelin-starred L’Atelier Joel Robuchon Singapore. The first section of the One-Michelin starred restaurant is more casual and open, where you get the Chef’s Tables by the open kitchen at the front end. The back end of the restaurant is ideal for private events in my opinion, or if you are looking for a more intimate dining space. The Food With its new Executive Chef, the whole menu has been revamped with a culinary focus on classic French dishes where you can expect to spot familiar notes of Asian spices, something which I find quite an interesting pairing throughout the courses. There is no ala carte menu at the moment, with the Five-course Lunch Degustation at S$158++ and Seven-course Dinner Degustation at S$298++. I am always excited to see a bread basket before the meal starts proper. We were served an assortment of freshly baked bread, which is very dangerous as I have to control my appetite to pace myself for the rest of the night. You know the dinner is off to a promising start when the complimentary amuse bouche is of such a substantial serving. The Foie Gras Symphony feels like it deserves a spot on its own as a course. Plated like an OCD style on a Delicate Jelly with Light Corn Purée, the circles are the corn purée topped with concentrated parsley. The foie gras flavour is light, along with various dimensions like the crunchy popcorn topped with white truffle shavings. The next course is the Scallop Ravioli with Kumquat Emulsion, Imperial Caviar and Young Baby Leek. I can’t really tell it is ravioli on first sight as the Hokkaido uni caught my eye first. The combination here is quite interesting as the emulsion on the dish has elements of Sarawak black pepper and a slight tinge of chilli oil, which makes it quite a different ravioli to have. I love the next dish as I am a mushroom lover. The Ceps Tartelette and Eggplant Caviar, with French Porcini Mushrooms and eggplant slices is elegantly presented in a rose style. To complement the dish, it is also served along with mushroom consommé which has elements of ginger and chicken essence. I would say the consommé lends the dish an oriental twist. 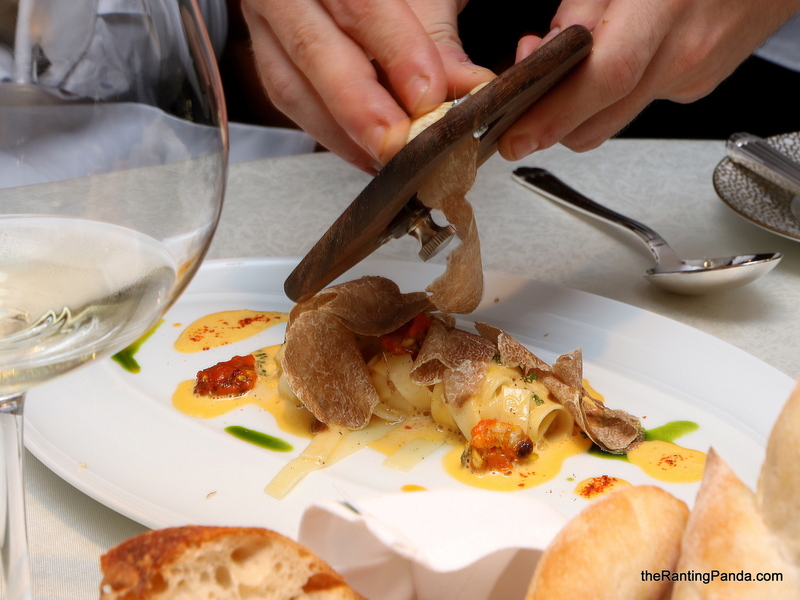 The next course is the Alba White Truffle Tagliatelle. The handmade pasta is coated with a creamy sauce of Shanghainese hairy crab along with white truffle shavings and female crab roes. Another dish with an east meets west element, I was surprised by the use of hairy crab which is traditionally only enjoyed at Chinese restaurants. The luscious hairy crab roe and pasta forms a stark contrast in terms of flavours, and it also reminds me of uni pasta in some ways. This dish is probably my favourite course of the night. The Slow-cooked Bresse Chicken is not just any ordinary chicken. Using chicken specially bred in Bresse, France, one of the best breeds in the world, the chicken is served with baby Paris mushrooms and white truffle shavings in ivory sauce, served along with a creamy risotto. For desserts, we first had the Fresh Tropical Fruit, a mix of pineapple and passionfruit. This is more like a refreshing palate cleanser which is light in flavours. The final course and dessert is the Orange and Citrus Marmalade, made from blood oranges. There are components of earl grey jelly and orange flesh slices here, topped with bergamot sorbet. I was expecting something heavier for the second dessert, which I feel will offer a better contrast to the first. The sides of the plate here are dotted with drips of vanilla cream and crisp-dried oranges. Rants The prices of the revamped concept is significantly higher than before, which is quite discouraging. Will I Return Again? The revamp of the space at Bacchanalia is a refreshing change for me. I like that the space is better designed where you can enjoy different dining ambience based on your mood. The dishes are generally good, though the hefty price tag will be a serious consideration to return. Make your reservation instantly at Bacchanalia by Vianney Massot here.